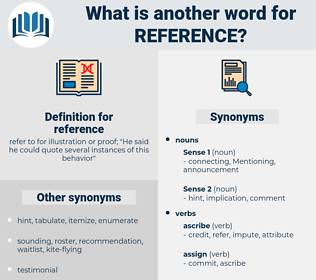 What is another word for reference? refer to for illustration or proof; " He said he could quote several instances of this behavior"
referent, authoritative, deductive, iconic, focal, Comparator. encumbrances, remarks, techniques, particulars, phrases, directives, arrangements, points, indicators, crossings, Cues, markings, settings, powers, invites, Duties, passages, urges, speakers, seeks, TBS, modalities, Referrals, erence, guidance. notices, purposes, returns, notes, Rejections, referees, Standards, listings, Suggestions, honors, citations, baselines, linkages, markers, outcomes, yardsticks, vouchers, Laboratories, signals, threats, leads, delegations, causes, signs, claims, employees, particulars, phrases, points, indicators, Referrals. Curricula, annexes, challenges, connection, remark, phrase, renvoi, accordance, guidance, deference, hint, recourse, yardstick, formulation, check-list, Comparator. 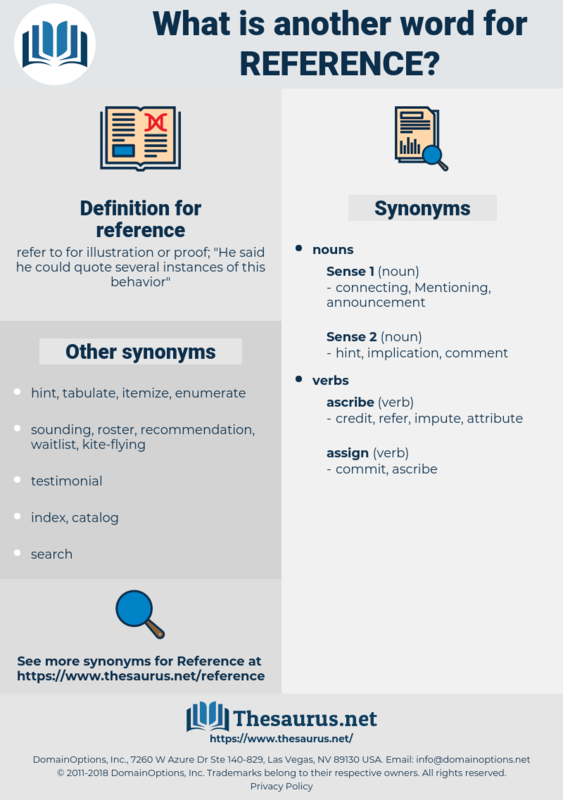 described, Indicated, Returned, noted, removed, corrected, Commented, Remanded, Responded, addressed, Alluded, pointed, covered, concluded, stressed, spoke, Discussed, touched, studied, Envisaged, Dealt, made. Transferring, comparing, wondering, Alluding, Receiving, Deferring, Needing, Suggesting, Implying, sending, using, Hinting, accepting, Postponing, Dismissing, highlighting, seeking, Basing, dealing. reflected, recorded, described, Indicated, Returned, noted, Transferred, removed, corrected, documented, directed, Consulted, addressed, Invoked, rejected, Forwarded, written, Explained, labelled, cleared, outlined, Wondered, pointed, covered, Entered, defined, acknowledged, deferred, enquired, amended, interpreted, fired, sampled, linked, hired, disclosed, endorsed, Issued, released, Queried, Urged, Deported, Discussed, trusted, touched, postponed, highlighted, decided, called, drawn, Promoted, devoted, named, Assessed, intended, Expelled, Examined, determined, Asked, sought, Dealt, made, benchmarked. concerns, indicates, applies, cites, exists, represents, considers, consults, Addresses, alludes, denotes, involves, returns, hints, says, establishes, shows, talks, sets, deals, points, Referrals, guidance. Now, as all this was a perfectly open reference to Monsieur Voltaire's history and adventures, it bit deep. A reference book, tha's what you'll be. refurnish, reappearance, rheiformes, refereeing, rubberneck, reverence, reburying, Reform Jew, rip-roaring.